Notre Dame has two of the better offensive lineman in the country who will be part of the 2018 NFL Draft. The first is left tackle Mike McGlinchey and the second is left guard Quenton Nelson. Both have been three year starters for the Irish. With the loss of Eric Wood and the uncertainty of Cordy Glenn means the Bills could look to add an offensive lineman early. McGlinchey is a fifth year senior and a three year starter for Notre Dame. In 2015 he started at right tackle and then in 2016 he was moved to left tackle after Ronnie Stanley left for the NFL. He has started 38 straight games for the Irish and obviously is a very durable performer. He is also a two year co-captain which gives you an idea of his leadership skills. The strong points for McGlinchey are his great size and length. As big as he is, he still has the frame to carry another 10 pounds easily. He is a good athlete with good quickness and has the agility to adjust on the move when in space. He has excellent hand use and knows how to use his long arms to his advantage. McGlinchey is well coached and knows how to play with leverage. The best thing Mike does is run block, showing quickness off the ball and then shows strength power and explosion on contact. McGlinchey consistently gets movement with his run blocks and he’s good getting to the second level and making productive blocks in space. For the most part, McGlinchey is a very good pass blocker but he has had some trouble with wide speed this year in two games. Both Georgia and Miami speed rushers were able to get by him on a few occasions. Part of the problem is he just didn’t set quick enough to combat wide speed. When going up against bull rushers he shows he can play with bend and anchor very well. He also does a nice job handling moves as he can slide and recover very well. McGlinchey has excellent balance and body control and you seldom see him off his feet. Overall, I feel his best position at the next level will be right tackle. While he can play on the left side and a team can get by with him I feel he could be a dominant player on the right side. 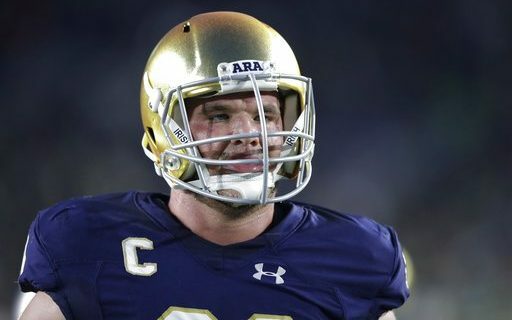 McGlinchey will be one of the first tackles drafted next April but how high he goes in the first round will be determined by how all 32 clubs feel about how well he can play on the left side. If they are like me and see him more as a right tackle than he is more than likely to get drafted somewhere in the teens not the top 10. Like McGlinchey, Nelson is a three year starter at left guard. He redshirted as a freshman and then played as a backup for the first game of his true sophomore year. Has been a starter ever since and has never missed a game due to injury. Nelson is huge at about 6’5 – 330. Early in his career he was said to have played at closer to 350 but that was too much weight for him. He moves around much better when in the 325-330 range. What everyone really likes about Quenton is he is an aggressive, nasty player and I say nasty in a good way. He almost never losses a battle and plays snap to whistle. He has excellent snap reaction and gets into his blocks very quickly. As a run blocker he dominates and not only gets consistent movement but often flattens his opponent. When he works a double team with McGlinchey, it’s all over as their opponent gets crushed! Nelson is good to the second level. He won’t win any speed contests and will probably run in the 5.35 – 5.40 range but he always takes good angles to linebackers and is efficient. While he is a good space player he still needs to improve his agility and ability to adjust on the move. As a pass blocker he shows the ability to dominate. He has a very strong punch, excellent hand use and can mirror. His ability to anchor is second to none and he has the feet and recovery quickness to stay with counter moves. Nelson is best suited to play in a zone scheme but he can really play in any scheme. He will come in and start right away as a rookie. His Combine workout will be interesting and the reason being is if he tests well, will some teams want him to play tackle. He was recruited to play tackle but was moved inside because Notre Dame already had quality at the tackle position. He may need to get below 325 to have the movement to play outside. Arm length will also be important. If his arms measure longer than 33″ than it is conceivable that he can be moved outside. For more of Greg’s scouting reports on this year’s Draft prospects, visit his author’s section at Buffalo Sports Page.